A 40-year-old woman with no significant past medical history presents to the emergency department after sudden onset of headache with subsequent syncope. Blood pressure = 152/94 and heart rate = 45 with otherwise normal vital signs. On exam, she exhibits nuchal rigidity with no focal neurologic defecit and complains of severe headache with nausea, but denies vomiting. Noncontrast head CT and CT angiography (CTA) of the head and neck was performed followed by conventional angiography. Noncontrast head CT (Figure 1) demonstrates extensive acute subarachnoid hemorrhage involving the suprasellar and right ambient cisterns extending into the anterior hemispheric fissure. 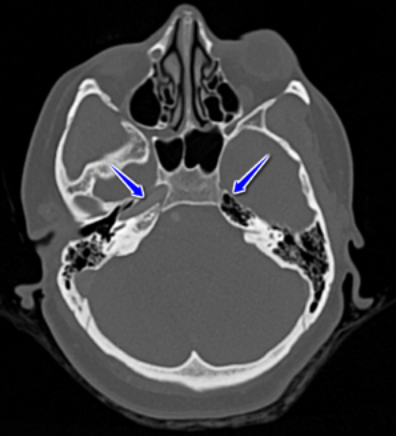 The temporal horns of the lateral ventricles are mildly prominent without evidence of transependymal edema. Close inspection of the bone windowed CT images (Figure 2) reveals asymmetric lack of a bony left internal carotid canal consistent with congenital left internal carotid artery (ICA) agenesis. Urgently performed conventional angiography includes lateral view injection of the right common carotid artery (Figure 3) demonstrating normal opacification of the right internal and external carotid arterial systems. 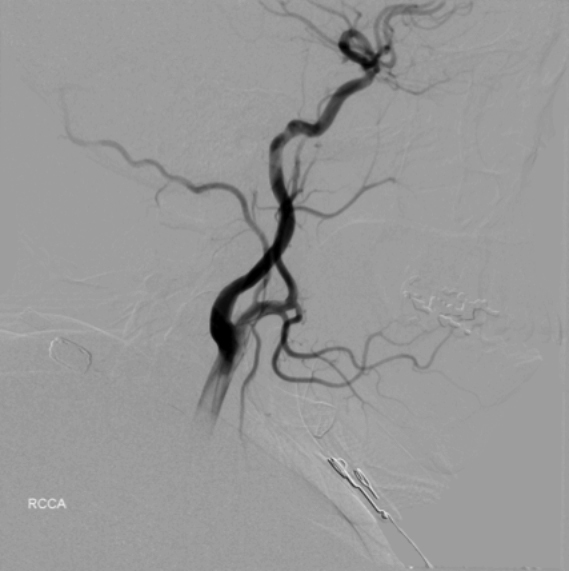 Contralateral left common carotid arterial angiography (Figure 4) shows complete lack of opacification of the left ICA distal to its origin without evidence of reconstitution. The left external carotid arterial system is widely patent. 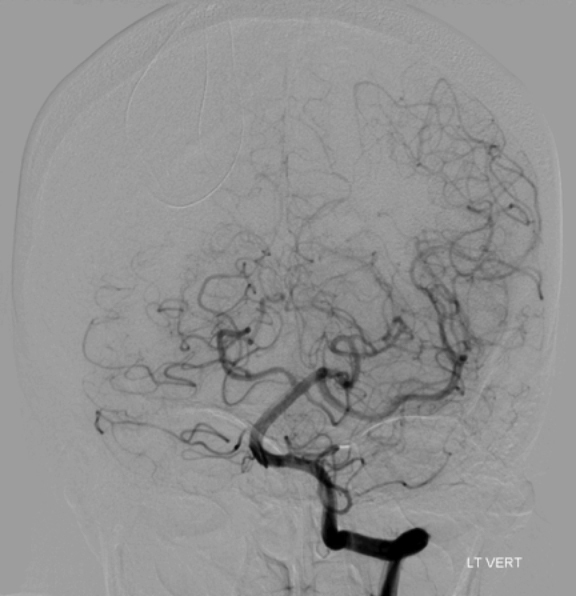 AP view digital subtraction angiography (Figure 4) following injection of the left vertebral artery demonstrates opacification of the left middle cerebral arterial (MCA) system. 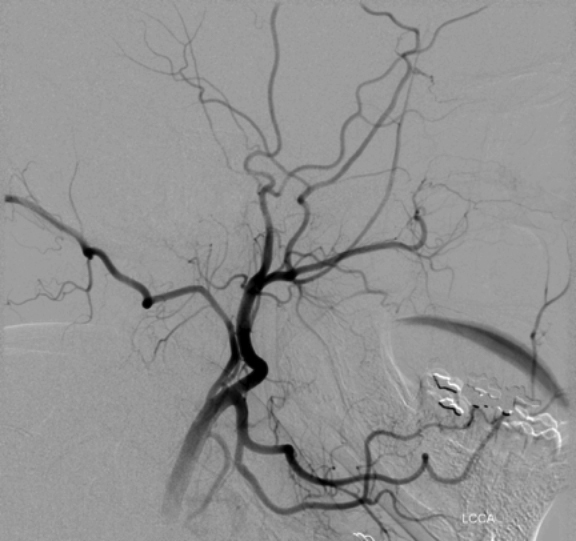 The left MCA was noted to be supplied by a patent and prominent left posterior communicating artery on CTA imaging (not shown). The left A1 segment was not visualized while the left A2 segment was supplied by a patent anterior communicating artery. No aneurysms were identified at either initial or followup angiography. The patient developed multifocal arterial stenoses during her hospital admission related to subarachnoid hemorrhage induced vasospasm which resolved prior to discharge. ICA agenesis is a rare congenetial abnormality due to failure of development of the embryologic first and third aortic arches as well as the dorsal aortic arch prior to development of the skull base in the fifth week of gestation. This is distinguished from incomplete development of the first and third arches which is thought to cause ICA hypoplasia, also a rare entity. Incidence of ICA agenesis (and hypoplasia) is estimated to be 0.01 percent and is most often unialateral. Approximately 132 cases of ICA agenesis have been reported in the literature since 1954, 20 of which were bilateral. Of the unilateral cases, 73 (65 percent) were left sided. Males and females appear to be affected equally, with the mean age at presentation approximately 38. ICA agenesis is often incidental, however it is of important note that ruptured and unruptured intracranial saccular aneurysms are found at much higher rates in these patients compared to the general population, particularly after the age of 30 (67 percent in one series2; although most sources cite estimates closer to 25-43 percent).4 There is therefore at least an approximately five-fold increased risk compared to the overall population incidence of 1-5 percent. Additional intracranial abnormalities reported to be associated with ICA agenesis include cerebrovascular insufficiency and hypopituitarism. The pathogenic correlation between ICA agenesis and aneurysm formation is not definitely known; however, it is hypothesized that increased hemodynamic stress on the normally developed side leads to aneursym formation. There are no definite guidelines regarding follow-up of these patients; however, one group imaged asymptomatic ICA agenesis/hypoplasia patients with MRA every five years.4 Although our patient demonstrated no evidence of aneursym, her extensive subarachnoid hemorrhage provides further evidence for the increased rate of serious complications in such patients. Although rare and often an incidental finding, congenital ICA agenesis is associated with abnormal collateralization and increased risk of intracranial aneurysm formation which is likely acquired. Such patients often demonstrate absence of the bony carotid canal on imaging and are at increased risk for cerebral ischemia and subarachnoid hemorrhage. Conventional angiography should be strongly considered, as well as long term follow-up CTA/MRA imaging, regardless of the presence of aneursym at the time of diagnosis. Czarnecki EJ, Silbergleit R, Mehta BA, Sanders WP. Absence of the supraclinoid internal carotid artery in association with intracranial aneurysms. Neuroradiology. 1998;40:11-14. Lee, J., Oh, C. W., Lee, S. H., & Han, D. H. Aplasia of the internal carotid artery. Acta Neurochirurgica. 2003;145(2):117-125. Florio F, S Balzano, M Nardella, V Strizzi, M Cammisa, V Bozzini. Congenital absence of the internal carotid artery. Cardiovascular and Interventional Radiology. 199;22(1):74-78. Zink, W. E., Komotar, R. J., & Meyers, P. M. Internal carotid aplasia/hypoplasia and intracranial saccular aneurysms: series of three new cases and systematic review of the literature. Journal of Neuroimaging. 2007;17(2)141-147. Moon W, Poro L, et al. Agenesis of internal carotid artery associated with congenital anterior hypopituitarism. Neuroradiology. 2002;44:138-142. Richardson AM, Dixon T, Kragha KO. 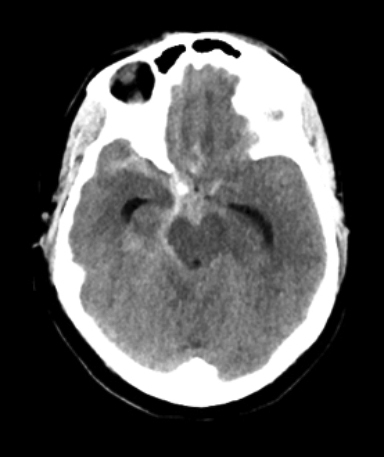 Spontaneous acute non-aneurysmal subarachnoid hemorrhage. Appl Radiol. 2017;46(12):32-34. Prepared by Dr. Richardson while a PGY-4 Diagnostic Radiology Resident; Mr. Dixon while a Medical Student; and Dr. Kragha while a Professor of Diagnostic Radiology, Department of Emergency Radiology, University of Louisville Hospital, Louisville, KY.